Barnstyle eco lodge - stunning ocean and mt views. Large spacious house with 5 Bedrooms and 2 Bathrooms - rural and private. 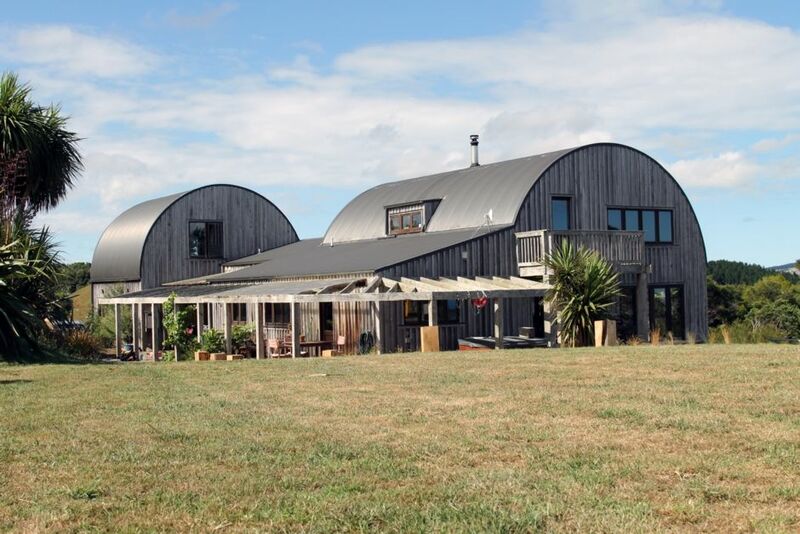 The BLODGE = Barn / Lodge is the perfect place for a group of family or friends to enjoy a relaxed private rural retreat away from town but close enough to the beach and surfing at Manu Bay and the points (10min) or Raglans wonderful shops and cafe’s (5min). Take the back road from The Blodge to Bridal Veil falls (10 min) or only 20 minutes to Ruapuke Beach when the surf is small or you crave some solitude. Stunning views of Mount Karioi and the ocean - surf checks from the upstairs look out. A mix of native bush, ocean and rural landscape. This rustic home is the perfect year round hideaway. A large deck, pizza oven, vege garden and generous lawns provide the perfect place to play, relax, entertain, or curl up and read a book or two from our private library. You will love the space. Beds available sleeps 14 people - with extra mattresses for larger groups. Minimum booking - 6 adults. The Blodge is also available for small weddings (100-120 people). Conditions and pricing on request. Pets may be allowed on request. Cleaning and linen provided. However please do leave the place tidy and the BBQ clean. Please keep noise to a minimum after 10 pm out of respect to the neighbours! Ideal for larger groups - minimum 6 adults. Spacious and unique barn style Eco accommodation. Two living rooms with extensive book collection. Pantry stocked for basic necessities. Large open plan with seating. We loved the house, it was absolutely perfect for our large group of six adults and two children. The views are sensational, and the boys (young and old) had a really fun time using the fire pit and the pizza oven - 8 hour roast lamb and pulled pork, yum. The young boys very much enjoyed the trampoline and kicking about a soccer ball on the large yard. The house was lovely and clean, and the indoor furniture was abundant and comfortable. There was a great selection of books and toys that we all had fun using. It seems like this is the owner's family home, and that they vacate it when guests come. Because of this it had a really lovely inviting feel, but did lack a few things such as closet or dresser storage space. There are also items of theirs around the property - a few cars, old unused equipment. When we first arrived we thought we had the wrong house because there were three cars there. None of this affected our stay, it's just worthwhile noting. We've stayed in many other Home Away houses where the properties are geared more towards guests - ie the bathrooms have a hair dryer, the closets and drawers are available for use, the mattresses and bedding are of a higher quality, etc. Again none of this affected our stay, I think it's just worthwhile mentioning. And in fact if anything, we were happy that the house has a lived in feel, so we didn't feel we had to be precious with anything. The owners could consider some more outdoor furniture to enjoy the stunning views, and it would have been great if the spa was fixed for use as it was something we were really looking forward to. We would stay here again, and recommend it to other family groups. Fantastic place and location! Worked perfectly for our large family group ranging in ages from 1 to 77! Fantastic spot with excellent views! House was very clean and beautiful character. The property is divine! What amazing views and such a great location, very quiet and peaceful location. The blodge has everything you would need for a perfect holiday, long or short. Great rooms and really spacious! I'd highly recommend this for any large groups of people. We had 13 in for the weekend and we had plenty of space and no crowding. Amazing property, will definitely be back! The Blodge is perfect for larger groups. The Blodge is perfect for larger groups. We, 4 families, had a fantastic time. The location is great and the views are amazing.